Hair dryer SC0020, wall mounted, individual use. 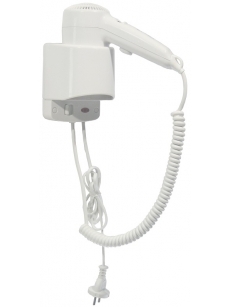 Exclusive hotel bathroom wall mounting hair dryer with a functional, robust and trendy design that blends into any space perfectly such as hotels, hospitals and elderly care centers. This powerful and long-lasting hair dryer is push-button activated and has a total power of 1,240W. Two heat/speed settings moving the push-button up and down. Position “1” for hot heating and position “2”for warm heating. SC0020: plastic ABS, white finish. SC0020CS: plastic ABS, black finish. White or black ABS plastic wall support. 11,000-13,000 rpm motor that includes a thermal overload switch. 1,200W heating element that includes a safety thermal cut-out. Speed selector with two settings (hot heating and warm heating). Heavy-duty 650-1,800mm coiled power cord. Plug with 1,000mm power cord. Turbine made in polycarbonate plastic.